Zion Market Research has published a new report titled “Active Wound Care Market by Product Type (Synthetic Skin Grafts, Allograft, Xenografts, Amniotic Tissue Grafts, Collagen Dressings, and Growth Factors); by Wound Type (Surgical Wounds, Ulcers [Pressure Ulcers, Diabetic Foot Ulcers, Arterial Ulcers, and Venous Ulcers], and Other Wounds), and by End Users (In-Patient Facilities and Out-Patient Facilities): Global Industry Perspective, Comprehensive Analysis and Forecast, 2017 - 2024”. 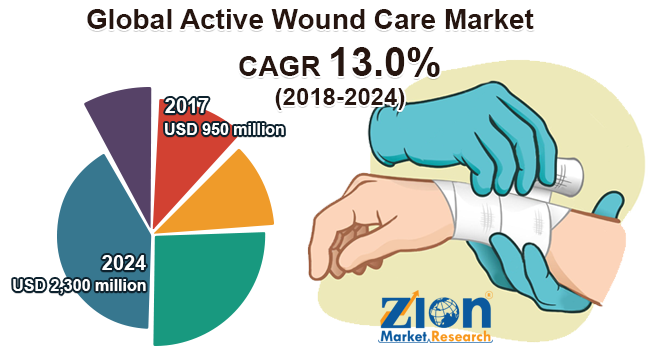 According to the report, the global active wound care market was valued at approximately USD 950 million in 2017 and is expected to generate revenue of around USD 2,300 million by end of 2024, growing at a CAGR of around 13.0% between 2018 and 2024. Disruption in the continuity of cells or anything which causes the separation of connecting tissue is termed as a wound. Wound healing is the restoration of that continuity. Some of the significant aspects propelling the expansion of active wound care market are rising government support such as funding for research activities, technological advancement in wound care product development, rising diabetic and geriatric population, and growing prevalence of chronic disease, increasing number of surgeries all over the world, and faster healing and recovery time are some of the key factors contributing towards the high growth of active wound care market globally. The increasing instances of mortality due to venous leg ulcers and diabetic foot ulcers amongst the elderly populations are further bolstering the demand for strategies related to active wound management in various developed and developing countries. The rising morbidity due to chronic wounds across the global patient population together with economic repercussions has led to the growth of this market in lesser developed societies and communities. In many of the developed and developing nations, the soaring number of cases of maturity-onset and type I diabetes has led to rising prevalence of diabetic ulcers, thus accelerating the market growth for active wound care. The active wound care market is segmented on the basis of product type into synthetic skin grafts, allograft, xenografts, amniotic tissue grafts, collagen dressings, and growth factors. The skin substitutes or grafts are used to control pain associated with a wound. Temporary and permanent are two major type of skin substitutes. The collagen dressing segment is estimated to grow at rapid CAGR in the global active wound care market during the period of 2018 to 2024. Based on wound type, the market is segmented into surgical wounds, ulcers, and other wounds. The ulcers segment is further sub-segmented into pressure ulcers, diabetic foot ulcers, arterial ulcers, and venous ulcers. By wound type, the ulcer segment accounted for the high revenue share in the global active wound care market. Among the ulcer segment, the diabetic foot ulcers segment is projected to have the highest CAGR during the forecast period. Approximately 15% to 25% of individuals with diabetes develop a foot ulcer at some point in their lifetime and an estimated 12% of those patients require lower extremity amputation. Diabetic foot ulcers account for nearly 2/3 of all non-traumatic amputations. Ulcer healing is complicated by diabetic neuropathy, decreased cellular synthesis, and susceptibility to infection and hence this segment is estimated to register the highest CAGR over the period of 2018–2024. In-patient facilities and out-patient facilities are the main end-user segments of the global active wound care market. The out-patient facilities segment dominated the market in terms of revenue in 2017. North America, Latin America, Europe, Asia Pacific, and the Middle East & Africa are key regional segments of the global active wound care market. North America and Europe are anticipated to remain the leading regions over the forecast period. There is a good adoption rate of the active wound dressing owing to the growing rate of patients who are suffering from burns, diabetes, and chronic wounds. Due to the high growth rate of healthcare awareness, the market for active wound care is growing significantly in the Asia Pacific region as well. Developing countries such as India and China are promising markets owing to the huge population base and the growing number of patients. Some of the key players in active wound care market include Smith and Nephew, Molnlycke Health Care AB, Integra Life Sciences Corporation, Baxter, Medtronic, ConvaTec Inc., Coloplast Corporation, Organogenesis Inc., KCI Licensing, Inc., Medline Industries, Inc., Avita Medical, Osiris Therapeutics, Inc., Cytori Therapeutics Inc., and Wright Medical Group N.V.